9. Slice with pretty sharp knife (but not serrated!!!) and ENJOY! 10. Store well packed in the fridge. My sourdough starter is 100% Hydration, contains 50% basic white bread flour and 50% wholemeal rye flour. Feeded on regulary basis at 12 hours intervals. I am usually using it after 5-8 hours after the last feeding. Wow, that is a lovely one. Wow, that is a lovely one. Well done. White flour in the starter? Nice looking loaf pstros - I can almost feel my health improving just looking at it. 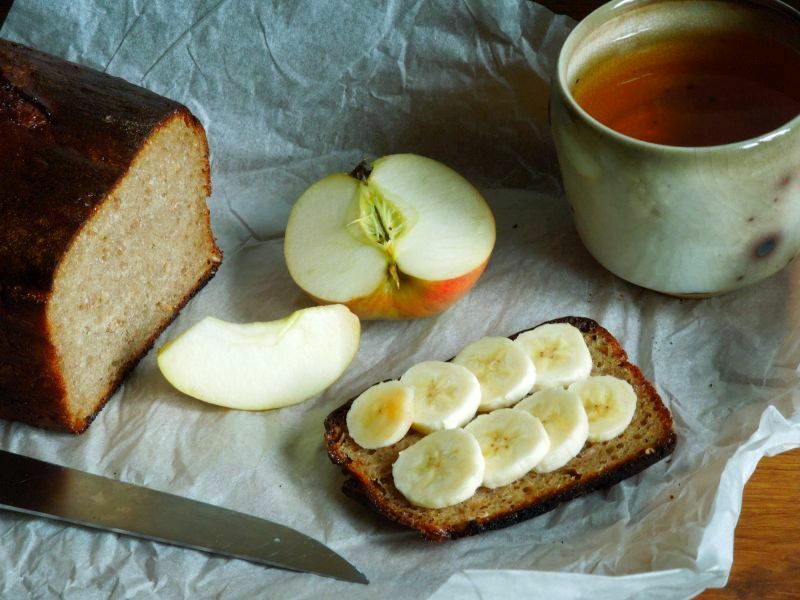 Have you tried making this bread using 100% rye flour, and if so what difference does it make? I think it is healthy with some ricotta cheese on it too! :-) I have not tried to make it with 100% wholemeal rye starter yet because currently I am running just this one starter as I feel it is slightly more versatile with 50% basic white flour. I am using it for all my breads including challahs and sweet breads. But once I try it with 100% wholemeal rye starter I will post an update. there's one thing I really don't understand. Do you really mean that an almost 100% rye dough should be kneaded for 20-30 minutes using stretch and fold to develop gluten? I tried several times many years ago (when I began to use rye flour) but the only thing I could get "kneading" rye for so long was pudding! The more I kneaded the more the dough liquified. ...the method I suggested above in the recipe is "slap and fold". This method is popular thanks to Richard Bertinet and it works really great for that kind of dough. I much more prefer about 10-15 minutes of "slap and fold" and continue about 10 minutes of simple folding the dough in the bowl until I feel the right consistency. I feel that strech and fold method is just insufficient for rich rye doughs. flour is moistened. No slapping or kneading. try it. Docking helps prevent roof separation. On Docking: I do not like to slash/score these types of bread. I am just steaming more frequently and spraying the top of bread massively during the first 15 minutes of baking. Thanks for your tips and have a nice day! What is actually happening with all the beating/slapping of 90% rye dough? Slapping "dry" or "wet" and I suppose the bench scraper is in one hand? During the kneading I just see and feel gluten development. At the start there is just some odd mass and when I finish I have fine thick paste-like dough. I must feel the structure. Next time I will try to do a photo. Bench scraper near hands is necessary while beating it. Lovely attractive loaf for 100% rye! As Nico and mini have noted, how would you slap and fold a clay-like dough such as yours? was it whole grain rye flour or light/ medium rye flour. Any how, all rye doughs have very little gluten to be developed , and when overmixed they risk breaking down. Nice crust, and love that crumb! How would you slap and fold a clay like dough such as this one? 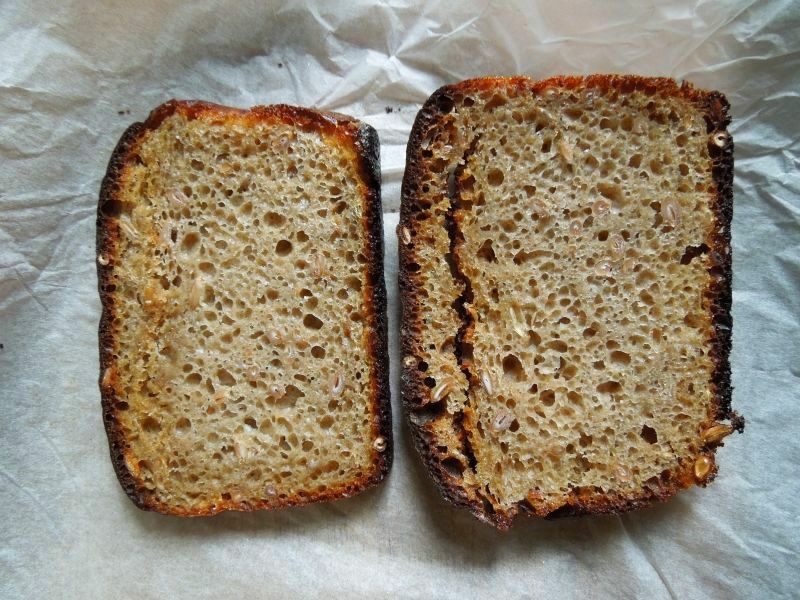 is thd rye flour whole, or medium/ light? 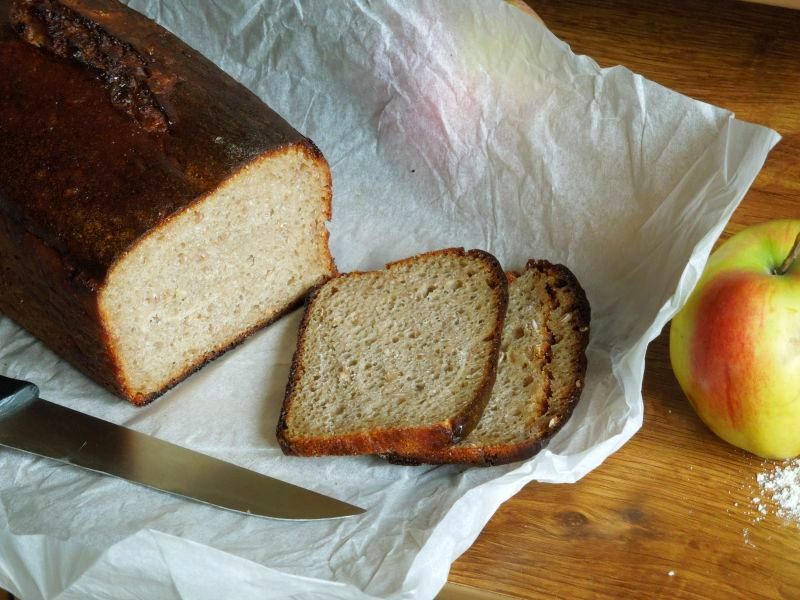 Hi Khalid, the flour used in the recipe is fine milled wholemeal rye flour from Czech Republic. Yes, with almost 100% rye dough is slap and fold method true challange but it wants just a little practice. It is a good exercise for the body! I love the crust color (and apples too.) And I'm also intrigued by the different approaches to wrangling high percentage rye breads. Usually the best I can manage shaping was is pouring it into a bread pan. It is a good looking loaf, well done. Making Rye bread is not an easy task. I just have one in the Oven and wonder how it will turn out. I did not do the Slap and fold method, I kneaded it well though I made a 50/50 rye bread. 50% Rye and 50% Bread Flour. I shall try your recipe next time. Is this 100g of the already cooked grains? Or 100g of dry rye grains before cooking? How do the 100g cooked Rye Grains count towards the flour? 400g whole meal rye flour+ 100g flour (in 100% hydration starter) = 500g flour total. Lovely loaf! I do notice there is a difference when handling high percentage rye dough where it seems more formed but I don't think it is gluten as much as it is the starchy gel and less grittiness. Perhaps all the particles of flour are suitably hydrated and it just feels a bit smoother. There was a baker on this site a few years ago that formed her whole wheat dough in the pan and then poured whey (left over from kefir) into the pan until it just covered the dough. When she baked it, the liquid evaporated and she had a shiny crusted,dark brown loaf with no steaming needed. I will have to try that someday. Thank you for your comment! The weight of rye grains is measured after it was cooked. So its weight include also some water absorved by grains during cooking. 200g of my starter contains 100g of water, 50g white bread flour and 50g organic wholemeal rye flour. Plus the recipe asks for another 400g wholemeal rye flour and 300g water. So in the finished dough we have overall 500g FLOUR and 400g WATER. Thank you for the tip on kefir using, it looks like I should try it someday! Could you specify the brand of the flour you used? The flour used for this recipe was by Pro-Bio brand and labelled as Wholemeal Rye fine flour (Celozrnná mouka žitná). To the subject of my time shedule: First fermentation is about 12 hours because we are developing unique flavour profile. Accoding to A. Whitley book where he is mentioning that wholemeal rye should be fermenting for about 16 hours or so. My primary goal within bread making is flavour. This means, that during making 100% rye bread to develop flavour profile is far more important than dough rising state (this applies on fermentation - first rise). Kneading: Dough was kneaded by "Slap and Fold" method for about 20-30 minutes. This is pretty nice excercise and cardio work out for me :-) You can find a lot of videos on YouTube on this kneading method if interested. But there is a lot of people which thinks that rye does not need kneading at all. So try what you like. Pro-Bio Wholemeal Rye fine flour is a very good flour. I permanently get the same results asi in your photos, using 100% of this flour. No kneading needed. pstros how old is your starter? How do you start your starter - I just put 100% hydrated starter in jar to make this lovely loaf - how long do I feed starter?